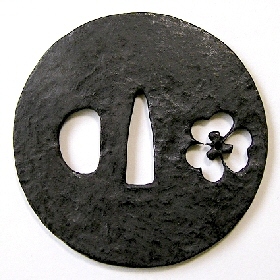 It is generally believed that the definition of Tosho-Tsuba is sword guard made by swordsmith not by tsuba craftsman. (2) Both the Maru-Gata (round shape) and the Mokko-Gata (Japanese quince shape) are most popular shapes. (3) We can only find simple technique from the finish of rims. (4) Only one or two simple openwork (or nothing) is given. 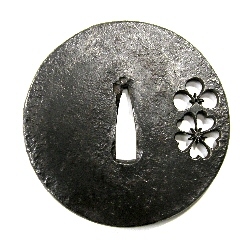 Even though the features above, we can find great artistic quality from Old Tosho-Tsuba because iron plate is forged very well, rust on surfaces has changed color to ebony black with the course of time, and, of hammered patterns made during production without producers' intentions.